We are happy to announce our new Testimonials extension for Magento 2. Testimonials are a great way to show that your brand or website is trusted by the community, has good reviews, and happy customers. It consists of a person’s written or spoken statement extolling the virtue of a product. 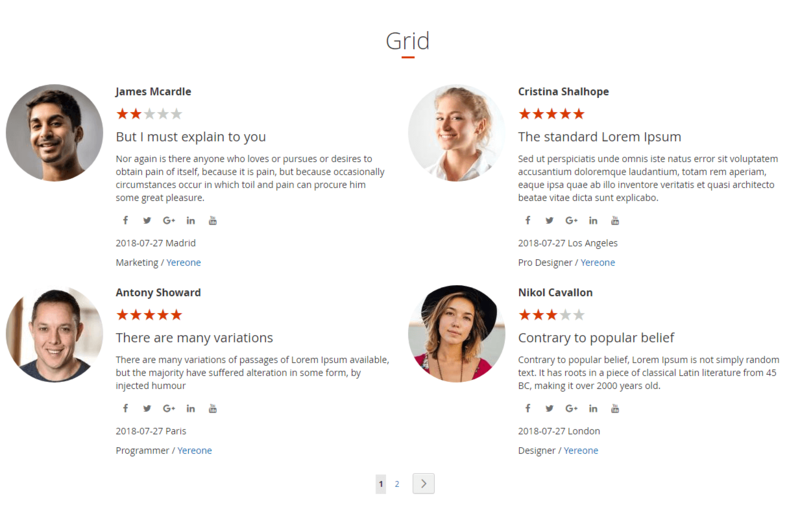 This extension allows to show testimonials on the frontend of your Magento 2 store, with either a slider or a grid mode. It can be also added as a widget, which has a lot of settings, like showing or hiding specific fields, do design changes and more. Also it is possible to enable form on the frontend, which will allow customers to add their reviews about website, which can later be shown on testimonials section.